Will your visit qualify as tourism or transit? Depending on your nationality and the length of your trip to Canada, you may need a tourist visa or a transit visa. This section covers the basics of tourist and transit visas to enter Canada. In order to visit Canada, you have to satisfy certain conditions. In this section, we look at the basics for who needs a tourist visa, the procedures and requirements for Visas for Canada. First, you must be healthy. You might need a doctor’s examination before you arrive to Canada depending on your country of current residence/origin. The importance of such a requirement was proven during the SARS crisis of 2003. Next, you must respect Canadian laws. This means that you are allowed to enter and visit Canada as long as you do not engage in any criminal activities during your stay. You are subject to Canadian laws while in Canada. Breaking any of those laws might result in the arrest, deportation and permanent prohibition from future travel to Canada. Additionally, you will need a valid passport, proof of who you are or other travel documents from your country of origin. In some cases, you will be required to provide proof of the purpose of your trip to Canada (such as a letter of invitation from a Canadian permanent resident or company). Finally, you may need a Temporary Resident Visa (TRV). Who needs a Tourist Visa? Afghanistan, Albania, Algeria, Angola, Argentina, Armenia, Azerbaijan, Bahrain, Bangladesh, Belarus, Belize, Benin, Bhutan, Bolivia, Bosnia-Herzegovina, Brazil, Bulgaria, Burkina Faso, Burundi, Cambodia, Cameroon, Cape Verde, Central African Republic, Chad, Chile, People’s Republic of China, Colombia, Comoros, Democratic Republic of the Congo, Costa Rica, Croatia, Cuba, Czech Republic, Djibouti, Dominica, Dominican Republic, East Timor, Ecuador, Egypt, El Salvador, Equatorial Guinea, Eritrea, Estonia, Ethiopia, Fiji, Gabon, Gambia, Georgia, Ghana, Grenada, Guatemala, Guinea, Guinea-Bissau, Guyana, Haiti, Honduras, Hungary, India, Indonesia, Iran, Iraq, Israel (only Israeli citizens holding valid Israeli “Travel Document in lieu of National Passport”), Ivory Coast, Jamaica, Jordan, Kazakhstan, Kenya, Kiribati, Korea, North, Kuwait, Kyrgyzstan, Laos, Latvia, Lebanon, Lesotho, Liberia, Libya, Lithuania, Macao S.A.R., Macedonia, Madagascar, Malawi, Malaysia, Maldives Islands, Mali, Marshall Islands, Mauritania, Mauritius, Micronesia, Fed. States, Moldova, Mongolia, Morocco, Mozambique, Myanmar (Burma), Nauru, Nepal, Nicaragua, Niger, Nigeria, Oman, Pakistan, Palau, Palestinian Authority, Panama, Paraguay, Peru, Philippines, Poland, Qatar, Romania, Russia, Rwanda, Sao Tomé e Principe, Kingdom of Saudi Arabia, Senegal, Serbia-Montenegro, Seychelles, Sierra Leone, Slovak Republic, Somalia, South Africa, Taiwan, Tajikistan, Tanzania, Thailand, Togo, Tonga, Trinidad and Tobago, Tunisia, Turkey, Turkmenistan, Tuvalu, Uganda, Ukraine, United Arab Emirates, Uruguay, Uzbekistan, Vanuatu, Venezuela, Vietnam, Yemen, Zambia & Zimbabwe. The visas are issued for different lengths of time depending on the traveller’s requirement and current Citizenship and Immigration Canada (CIC) rules and regulations. 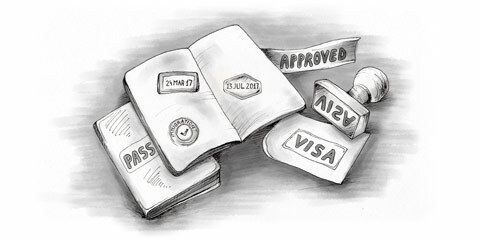 Who does not need a Tourist Visa? If you qualify under one or more of the above, you are permitted to stay in Canada for a period of up to 6 months. To obtain an extension, you will need to leave Canada and re-enter or apply in Canada for an extension. In some instances, a traveller stopping in Canada for less than 48 hours on their way to another country may require a Transit Visa. The list of countries requiring a tourist visa is the same as for the transit visa. What kind of visa is needed? I have a friend who is going to HK and on his way there he is staying here for 15 horas. On his way back he is thinking in stopping by Canada for a day and going to NY by bus for three days. After that he wants to come back to take the airplane back to his country. What kind of visa does he need? Please advise.